Ilia Tolstoy (centre) from How the Silent Enemy was Made, 1930. ...we were in plain sight of the whole band of Eskimos. The igloos were built on a rocky point, while the entire tribe seemed to be scattered a mile or so out on the ice. “Fishing,” was our thought, and at once we knew that our friends were in a bad way. No Eskimo fishes inland through the ice in winter unless he has missed the herds of caribou in the fall and has been unable to stock up with meat and fat until the next spring. Day after day I waited — and watched.... Everything in the land had at first been beautiful in my eyes — but God! how the awful silence of its vast space grips you. Even now I felt it, even before the great covering of snow had muffled every corner of the earth, and land and water came to be bound in iron ice-grip. A grandson of the great novelist, Leo Tolstoy, ilia Tolstoy was born at Toptivovo, Tula, Russia, to Andrey L. Tolstoy and Olga Diterichs, daughter of Czarist officer, General K. K. Diterichs. Following schooling in Odessa and the Moscow School of Agriculture, he was a cornet in the Imperial Cavalry and served at Tashkent. He later joined the Lieb Guards Dragoon for the White Army during the revolution. A taste for horses and exploration developed early in life. In 1915, at the age of only twelve, he was assistant to the Director of Cavalry Training Command, and traveled on horseback from Samarkand to Pewhawar. In 191718 he worked for the Russian Department of Agriculture and was on assignment in Turkestan. Between 1922 and 1924 he was active on the Volga, assisting with famine relief. Unsympathetic to the new Soviet regime, Tolstoy emigrated to the United States in 1924 and took further training at William Penn College followed by studies in animal husbandry at the University of Iowa, Ames. In 1927, Tolstoy became associated with the explorer and naturalist, William Douglas Burden, an associate and trustee of the New York Museum of Natural History. It was in connection with Burden’s production of the film, The Silent Enemy, that Tolstoy undertook a venture into the Canadian barren lands of Keewatin in search of the caribou. Following this expedition, Tolstoy spent time in Alaska assisting in the planning of the new Mount McKinley National Park. He was inducted into the Explorers Club in New York in 1931. Throughout the 1930s he was involved in several film ventures and expeditions to Central and South America, and he did important work in the development of underwater photography. His greatest adventure came during World War II when, as a U.S. Army Colonel, he and Colonel Brook Dolan ventured to Tibet in the service of “Wild Bill” Donovan, the head of the American Office of Strategic Services. The details of this venture were published in the National Geographic Magazine (August, 1946). Tolstoy’s interests in conservation were many. He was one of the founders of Marineland in Florida, of the Bahamas National Trust, and he served on the Caribbean Conservation Commission. He was also active in supporting the Tolstoy Foundation in New York State, established by his Aunt, Alexandra Tolstoy, and in work in support of Tibet and Tibetan refugees. Northern Manitoba and the Keewatin district west of Hudson Bay showing Tolstoy's route to the Nueltin and Windy Lakes region. It is not clear just how the decision was made to go to Nueltin. Burden and Tolstoy were both knowledgeable about North American wildlife conditions, based on their studies and from field experience and the literature. They were also well connected with the zoological research establishment in New York, including acquaintance with the influential President of the New York Zoological Society, Madison Grant, an expert on caribou. Thierry Mallet of the Paris-based fur trade firm, Revillon Freres, was also consulted in advance, for he had travelled from the Pas to the Kazan River in 1926 and is acknowledged in the film’s promotional literature. It is unlikely, based on the evidence, that Burden’s organization had any contact with Oberholtzer, but the route taken north by Tolstoy was essentially the same as that taken by Oberholtzer. Officials with the Hudson’s Bay Company were undoubtedly contacted in Winnipeg before the party departed north. Supplementary information and advice was picked up, sometimes fortuitously, while en route. The ultimate destination appears to have been established well in advance however, for Tols toy was a thoroughly organized man in all matters. Once moving north beyond the middle Churchill River however, the party would be moving into little understood territory where few could assist them. We have already seen that in the last half of the nineteenth century only a small number of fur trade posts were established in the Keewatin District. Precious few were added in the first decades of the twentieth, these often being of a rather temporary nature. While most of these posts were far removed from each other, there was one geographic focus where a number of them were found in relatively close proximity. The tree-line associated with the “land of little sticks” passes north of Nueltin Lake. 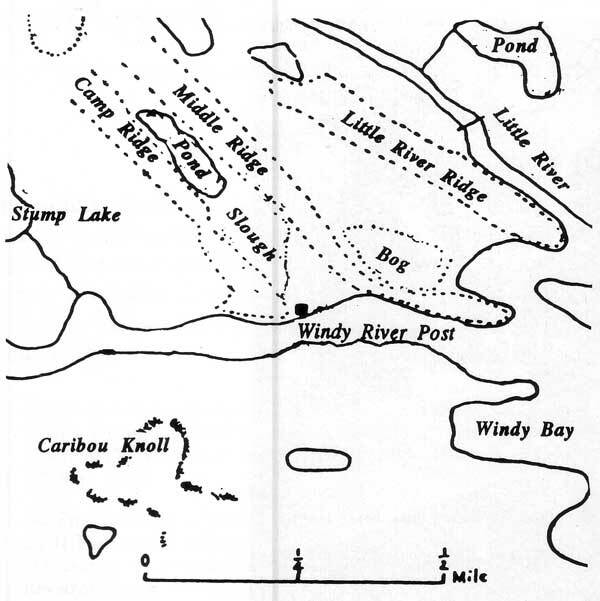 On the western edge of the lake there is an important location for human provisioning owing to the local topography along Windy River which encourages the caribou, during its southern fall migration, to funnel together and cross at predictable locations. In his quest for realistic wildlife film footage of the caribou en masse, it was to this vicinity that Tolstoy headed, as did Francis Harper twenty years later when undertaking his important study of the barren ground caribou. In the literature of The Silent Enemy, the impression is given that Tolstoy failed to find the caribou. Some qualification of the extent of the failure is required however. On this trip he and his party did see thousands of head, but from the standpoint of cinematography, the big herd had not come close enough for their purpose. Of the few outsiders who had previously visited these parts of the barren lands, most had come during the spring, summer and fall, retiring from the country for the winter. This was necessarily not the case with Tolstoy’s venture. His party planned to winter over if necessary, in keeping with its main purpose, which was to meet the fall migration, in which caribou would be making their way south through the “land of little sticks” and into the fringes of the woodlands where they could receive some protection from the harsh winter winds and be able to feed, with the aid of their large snow-shovel-like hooves, on the vegetation beneath the less crusted-over forest floor. Ilia Tolstoy (centre) with Long Lance (left) and Bob Hennessey on the Temagami set of The Silent Enemy. Tolstoy explained how after encountering Laird on Frog Portage months before, they had made good time to Brochet and had succeeded in canoeing on to Windy Lake before freeze-up — a stiff voyage. There they were billeted at the Revillon Post. But disappointment awaited them, for the caribou, always unpredictable, failed to come within range of their cameras. The logic of the Caribou crossing at Windy River. 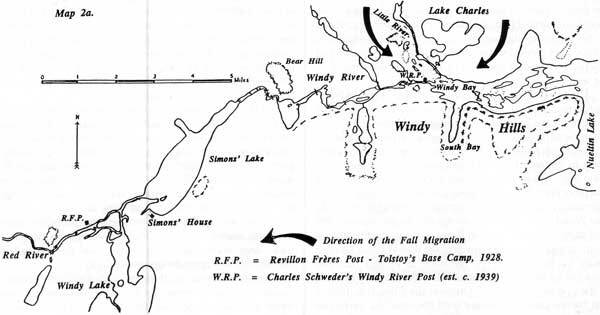 Movements had been made northward from Windy Lake in search of the caribou, for Tolstoy later reported meetings with “Eskimos.” The most humorous incident of the trip he stated, was their reception of eighteen Eskimo trappers in their small tent and a debauch of raisins and chocolate. With mounting evidence that no large number of caribou had moved south, there was little point in remaining for the rest of the winter in hopes of catching sight of them moving north again in spring. 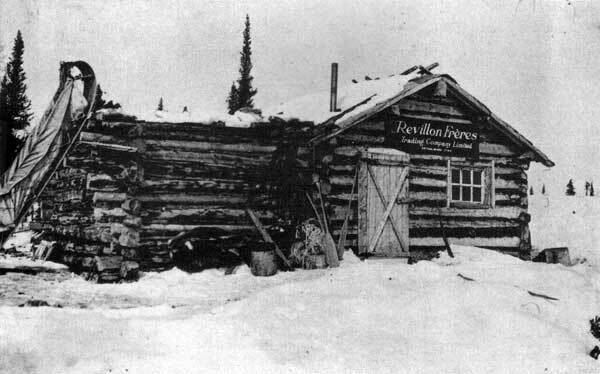 The Revillon Freres Post at Windy Lake (1929) where Tolstoy and his party were billeted. Detail of the Windy River region. The various ridges north of the post would channel the southward moving caribou towards Windy River and South Bay further to the east. 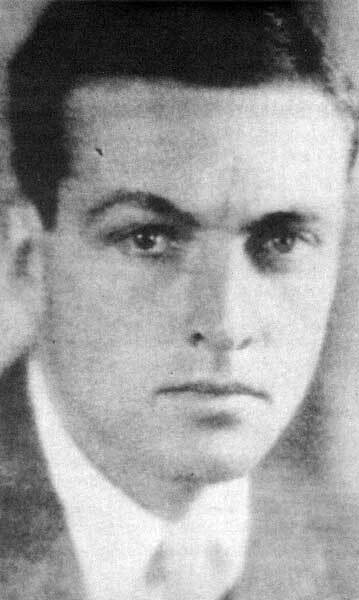 William Burden, who along with William Chanler produced The Silent Enemy in 1930, one of the last great silent films. 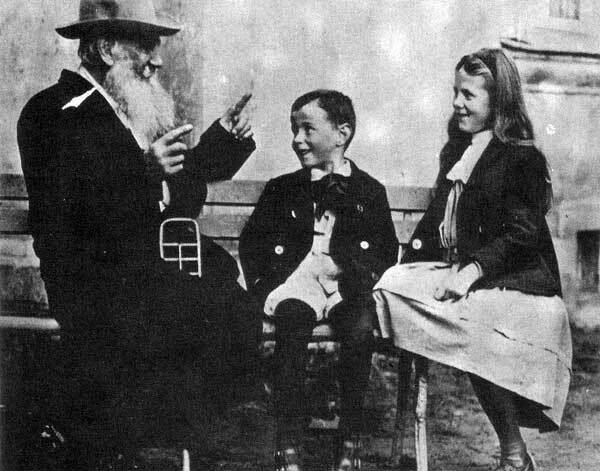 Ilia Tolstoy as a boy and his sister Sonya with their famous novelist grandfather, Leo Tolstoy, 1909. The author gratefully acknowledges the assistance of the following during the preparation of this article: Julia Clark of the Abbe Museum of Bar Harbour, Maine; R. H. Cockburn, Bunny McBride, Donald B. Smith, Clarence and Penny Tillenius, Tanya Tolstoy Penkrat, The Explorer’s Club of New York. 1. On the development of fur trade activity in the Keewatin District, see Peter J. Usher, Fur Trade Posts of the Northwest Territories, 1870-1970 (Ottawa: Department of Indian Affairs and Northern Development, 1970), p. 139 ff. 2. See Fred Breummer, ‘The Tree-line’ The Beaver, Outfit 309 (2) (1978), 26-31. For a review of literature and material culture of the Chipewyan of this area, see Loraine Brandson, From Tundra To Forest: A Chipewyan Resource Manual (Winnipeg: Manitoba Museum of Man and Nature, 1981); on the interior Inuit, see ‘Father Caste Meets the Inland Eskimo’ (1868) Eskimo 57 (1960), 3-15. The literature on the “Caribou Eskimo” is reviewed in Signs of the Past at Eskimo Point: Cultural Resources and Tourism Opportunities. Report to the Department of Economic Development and Tourism, North West Territories (Winnipeg: The Crocus Group, 1982). For a series of fine photographs of Chipewyan life at Caribou, Manitoba, just south of the North West Territories boundary, see Richard Harrington and Clifford Wilson, Northern Exposures (Toronto: Thomas Nelson, 1953), pp. 10-31. 3. Samuel Hearne, A Journey From Prince of Wales Fort in Hudson’s Bay to the Northern Ocean, J. B. Tyrrell, ed. (Toronto: Champlain Society, 1911), End Map, ‘Exhibiting Mr. Hearne’s Tracks’. 4. David F. Pelly, Thelon: A River Sanctuary (Hyde Park: Canadian Recreational Canoeing Association. 1996), pp. 7-10; James F. Kenney, ed. The Founding of Churchill, Being the Journal of Captain James Knight. (Toronto: J. M. Dent, 1932), pp. 55-59: Sylvia Van Kirk, ‘Thanadelthur’ The Beaver Outfit 304 (4) (1974), 40-45. 5. David Thompson, Narrative of his Explorations in Western North America, 1784-1814. J. B. Tyrrell, ed. (Toronto: The Champlain Society, 1916), pp. 133-34; J.A. Rogers, ‘Lac Du Brochet’ The Beaver (March, 1945), p. 11. 7. Rogers (1945), p. 11. 8. J. B. Tyrrell, Report on the Doobant, Kazan and Ferguson Rivers and the Northwest Coast of Hudson Bay. (Ottawa: Geological Survey of Canada, 1897); Report on the country between Athabasca Lake and Churchill River. Part D. Annual Report. Vol. 8. (Ottawa: Geological Survey of Canada, 1896); J. W. Tyrrell, Across the Sub-Arctics of Canada. (Toronto: William Briggs, 1897). 11. Bryan C. Gordon, ‘Prehistoric Chipewyan Harvesting at a Barrenland Caribou Water Crossing’ The Western Canadian Journal of Anthropology 7 (1)(1977), 69-83. 12. Thierry Mallet, Glimpses of the Barren Lands (New York: Revillon Freres, 1930), p. 129. 13. Angus Buchanan, The Wildlife of Canada (London: John Murray, 1920), p. 108. Buchanan was citing MacFarlane’s statistics as reported in Charles Mair and Roderick MacFarlane, Through the Mackenzie Basin (Toronto: William Briggs, 1908), p. 168. 14. Buchanan (1920), p. 110. 17. William Douglas Burden in interview with Donald B. Smith, May 4, 1977. Glenbow Alberta Archives. Donald B. Smith Fonds. Tape-recording. RCT-292. 19. William Douglas Burden, et al. How the Silent Enemy Was Made. Souvenir Edition. Paramount Pictures, (c. 1930), p. 8; Burden in conversation with Smith (1977). 20. Picard didnot always have an easy time adjusting to winter conditions. See Kevin Brownlow, The War, the West and the Wilderness. (New York: Alfred Knopf, 1979), p. 555. 21. Burden in Conversation with Smith (1977). 22. W. Douglas Burden, et al, (c. 1930), pp. 9,12; Brownlow, (1979), p. 550 ff. 23: Joe Paddock, Keeper of the Wild: The Life of Ernest Oberholtzer (St. Paul: Minnesota Historical Society Press, 2001), p. 89. 24. Burden has left a memoir of many of his experiences as explorer and naturalist. See W. Douglas Burden, Look to the Wilderness. (Boston: Little, Brown and Company. 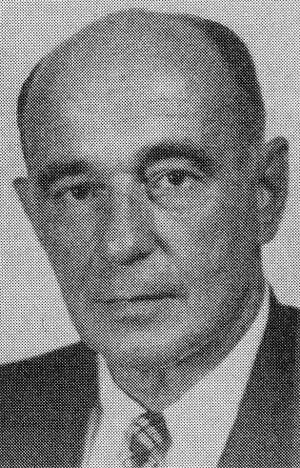 1956). 25. Burden In Conversation with Smith (1977); Burden et al. (c.1930), pp.3, 5; and see Madison Grant, The Caribou. New York Zoological Society, Seventh Annual Report. (New York: 1902); and A. W. F. Banfield, A Revision of the Reindeer and Caribou, Genus Rangifer (Ottawa: Ministry of Northern Affairs and Natural Resources, 1961), p. 6. 26. Thierry Mallet, ‘Exploring the Kazan’ The Beaver (March, 1950), 22-25; Burden et al., (1930), p. 3; Burden in Conversation with Smith (1977); Personal communication, Clarence Tillenius, Winnipeg, to the author, February 2003. 27. See Paddock, (2001), p. 80; and R. H. Cockburn, ‘Voyage to Nutheltin’ The Beaver (Jan.-Feb. 1986), 4-27. 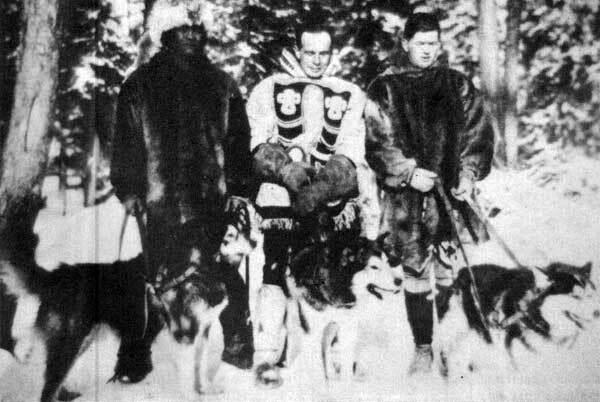 Contact between Burden/Tolstoy and Oberholtzer is unlikely since in 1939, that other intrepid explorer of the Nueltin Lake country, P. C. Downes, only learned of Oberholtzer’s trip after coming out from his own venture into the barrens and encountering Cecil “Huskey” Harris at Churchill, who recalled Oberholtzer’s trip. Downes tracked down Oberholtzer, later acknowledging his 1912 achievement in his book, Sleeping Island (1943). See Cockburn (1986), p. 5. 28. However, The Hudson’s Bay Company’s Beaver Magazine, then still very much a company organ, makes no mention of Tolstoy’s presence in Winnipeg in 1928 or 1929. 29. Cockburn (1990), p. 17; Explorer’s Club of New York. Archives. Ilia Tolstoy to Ward Randol, Sept. 21, 1970; Donald B. Smith, Long Lance: The Story of a True Imposter (Toronto: MacMillan, 1982), pp. 198-204; Tolstoy no doubt had consulted the reports of J. B. Tyrrell, whose important geological map of 1897 indicates the edge of the barren lands running east to west through the very centre of Nueltin Lake. See J. B. Tyrrell, Report on the Doobaunt, Kazan and Ferguson Rivers and the Northwest Coast of Hudson Bay. (Ottawa: Geological Survey of Canada, 1897), Endmap. 30. See Usher, (1970), p. 139 ff., and also R. H. Cockburn, ‘Revillon Man’ The Beaver 70 (1) (1990), p. 17. 31. See Francis Harper, The Barren Ground Caribou of Keewatin (Lawrence: University of Kansas, 1955) and other works of Harper’s in the Bibliography. 32. The official story concerning Tolstoy’s filming of the caribou is diplomatic but often less than accurate. W. Douglas Burden et al. How the Silent Enemy was Made. Souvenir Edition. Paramount Pictures (c. 1930), p.8; Milestone Films and Video. Re-release: ‘The Silent Enemy: An Epic of the American Indians’, 1992. Supplemental tape-recorded interview: W. Douglas Burden with Kevin Brownlow; Brownlow (1979), 558-9; Bunny McBride, Molly Spotted Elk: A Penobscot in Paris (Norman: University of Oklahoma Press, 1995), pp. 114-15; and Burden in conversation with Smith (1977). 33. See George Calef, Caribou and the barren-lands (Toronto: Firefly Books, 1981), pp. 16-17; John P. Kelsall, The Migratory Barren-ground Caribou of Canada (Ottawa: Department of Indian and Northern Affairs, 1968), Ch. 4. 34. See Cockburn (1990), pp. 17, 19; on the lives of traders active in this area in the twentieth century, see Gerry Dunning, “When the Foxes Ran” (Air Ronge, Saskatchewan: n.d.). 35. Cockburn (1990), p. 17. 36. A post at Pelican Narrows was established by the HBC in 1793 to counteract the Montreal traders moving into the Athabasca country. Abandoned in 1799, it was re-opened in 1818. A new post was established in 1874 on the north shore of Pelican Lake. 37. Cockburn (1990), p. 17. 38. An inspection of 1:250,000 topographical map sheets for this area is instructive for conveying the complexity of the landscape. For the headwaters of the Thlewiaza, Windy Lake and Nueltin Lake see Energy Mines and Resources. Topographical Series. Kasmere Lake Sheet. MN, Ennadai Lake Sheet, 65C, and Nueltlin Lake Sheet, 65B. 39. Photographs of the Revillon Freres post at Windy Lake appear in Cockburn (1990). Photos of posts at Windy River (Charles Schweder’s post) and the post at Simon’s Lake, appear in Dunning (n.d.). The latter are based on photos taken by Francis Harper. 40. Ilia Tolstoy, quoted in: ‘Northern Caribou Changing Habits’ Victoria Colonist, Feb. 2, 1929. The Windy Lake Trading Post was at 60 degree, 35’N and 99 degrees 50’W. 41. That is to say, the caribou failed in the particular locale frequented by Tolstoy. If he had been in the Fort Reliance area with W.H.B Hoare, in February of 1929, he might well have obtained his required film footage. See W. H. B. Hoare, Journal of a Barrenlander, 1928-1929 (Ottawa: 1990), p. 112. See also, Kalsall (1968), Ch. 4. 42. Cockburn (1990), pp. 18-19. 43. ‘Northern Caribou Changing Habits’ Victoria Colonist, Feb. 2, 1929. 44. On Yandle, see Cockburn (1990), p. 19; Dunning (n.d.), p. 68. 45. Cockburn (1990), p. 19; Personal Communication, Tillenius to the author, Feb. 2003. 46. ‘Northern Caribou Changing Habits’ Victoria Colonist, Feb. 2, 1929. Only the most fleeting glimpses of George Yandle are available in the literature. In addition to the Wallace Laird references, he is mentioned by Norwegian trapper Frits Oftedal (b. 1905) who entered the Hook Lake country in 1926. He claimed to have stayed in George Yandle’s cabin at Nueltin in 1929 and stated that Yandle drowned on September 24, 1929. (Dunning. n.d. p. 68). This seems to be a confusion of dates however. W. Gillies Ross mentions purchasing, in 1934, a freighter canoe from “a Swedish trapper named Ralph Yandle” at Padlei Post. (W. Gillies Ross, ‘On the Barrens, 1934’ The Beaver (Autumn, 1968), p. 52). The name “Ralph” is undoubtedly a confusion. Officers of the Hudson’s Bay Company at Churchill reported George Yandle’s death by drowning in 1936 and a brief obituary notice to that effect was published in the March, 1937 issue of The Beaver (p. 58). 48. ‘Northern Caribou Changing Habits ‘ Victoria Colonist, Feb. 2, 1929. 49. Northwest Territories. Wildlife Service. Beverly and Kaminuriak Caribou. Monitoring and Land Use Controls. Completion Report No. 1. (Yellowknife: 1978); Sandford D. Schemnitz, ed. Wildlife Management Techniques Manual. 4th ed. Rev. (Washington, D.C. The Wildlife Society, 1980), pp. 294-5. 50. Brownlow (1979), p. 559; Burden in Conversation with Smith (1977). See also, E. Newton-White, ‘What is a Reindeer - Anyway?’ The Canadian Forum 10 (1930), 395-6, and H. John Russell, The Nature of Caribou: Spirit of the North, (Vancouver: Douglas and McIntyre, 1998), p. 18 ff. 51. Brownlow (1979), p. 559; Burden in Conversation with Smith (1977). See also, E. Newton-White, ‘What is a Reindeer - Anyway?’ The Canadian Forum 10 (1930), 395-6, and H. John Russell, The Nature of Caribou: Spirit of the North, (Vancouver: Douglas and McIntyre, 1998), p. 18 ff. 52. See McBride, (1995), pp. 108-9, 115. 53. The complete story is told in Donald B. Smith, Long Lance: The Story of a True Imposter (Toronto: MacMillan, 1982). 55. Burden in conversation with Smith (1977). 56. Burden in conversation with Smith (1977); Brownlow (1979), pp. 55960. 57. Explorer’s Club of New York. Archives. Tolstoy Papers. 58. See Corey Ford, Donovan of OSS (Boston: Little Brown, 1970), pp. 134, 213-16. 59. Ilia Tolstoy, ‘Across Tibet from India to China’ National Geographic Magazine 90 (2) (August, 1946), 169-222. 60. ‘Northern Caribou Changing Habits’ Victoria Colonist, Feb. 2, 1929. 61. Robert Payne, ‘Foreword’ to Rosemary Jones Tung, A Portrait of Lost Tibet. Photographs by Ilya Tolstoy and Brooke Dolan (New York: 1980), pp. ix-xi. See also Robert Payne, Eyewitness: A Personal Account of a Tumultuous Decade, 1937-1946 (Garden City: Doubleday and Company, 1972), pp. 258-9; and Karl E. Meyer and Shareen Blair Brysac, Tournament of Shadows: The Great Game and the Race for Empire in Central Asia (Washington: Counterpoint, 1999), pp. 532-50. Abbe Museum Archives. Bar Harbor, Maine. “The Silent Enemy” Fonds. Alberta Glenbow Institute, Calgary. Donald B. Smith Fonds. Explorer’s Club of New York. Archives. Ilia Tolstoy Personal Papers. Hudson’s Bay Company Archives. Winnipeg. Letters of A. Wallace Laird. Private Collection of Robert H. Cockburn. Milestone Film and Video. Re-release: ‘The Silent Enemy: An Epic of the American Indians’ 1992. Supplemental tape-recorded interview: W. Douglas Burden with Kevin Brownlow. Birket-Smith, Kaj, The Caribou Eskimos. Report of the Fifth Thule Expedition. Vol. 5. Part I and II. Copenhagen: 1929. Birket-Smith, Kaj, Geographical Notes on the Barren Grounds. Report of the Fifth Thule Expedition. Vol. 5. Part IV. Copenhagen. 1929. Brownlow, Kevin, The War, the West and the Wilderness. New York: Alfred Knopf, 1979. Buchanan, Angus, Wild Lift in Canada. London: John Murray, 1920. Burden, W. Douglas, Look to the Wilderness. Boston: Little, Brown and Company. 1956. Burden, W. Douglas, et al. How the Silent Enemy Was Made. Souvenir Edition. Paramount Pictures, (c.1930). Calet. George. Caribou and the barren-lands. Toronto: Firefly Books, 1981. Canada. Report of the Royal Commission to Investigate the Possibilities of the the Reindeer and Musk-Ox Industries in the Arctic and Sub-Arctic Regions of Canada. Ottawa: Department of the Interior, 1922. ‘Caribou Numbers Not Declining’ Victoria Colonist, Feb.2, 1929. Cockburn, R. H. ‘Revillon Man’ The Beaver 70 (1) (1990), 12-26. 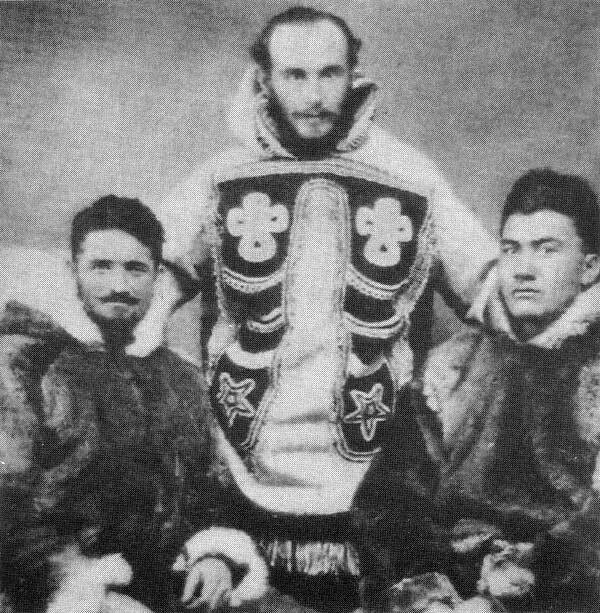 Harper, Francis, Caribou Eskimos of the Kazan. Lawrence: University of Kansas, 1964. Harper, Francis, Caribou of the Barren Lands. Lawrence: University of Kansas, 1955. Harper, Francis, Mammals of Keewatin. Lawrence: University of Kansas, 1956. Hodgins, Bruce W. and Benedickson, Jamie. The Temagami Experience. Toronto: University of Toronto Press, 1989. Hoare, W. H. B. Journal of a Barrenlander, 1928-1929. Sheila C. Thompson, ed. Ottawa: 1990. Hulley, Clarence C. Alaska: 1741-1953. Portland: Binfords and Mort, 1953. Kelsall, John P. The Migratory Barren-ground Caribou of Canada. Ottawa: Department of Indian and Northern Affairs, 1968. Lofthouse, J. ‘A Trip on the Tha-Anne River, Hudson Bay’ Geographical Journal 13 (1899), 274-77. Mallet, Thierry, Glimpses of the Barren Lands. New York: Revillon Freres, 1930. McBride, Bunny, Molly Spotted Elk: A Penobscot in Paris Norman: University of Oklahoma Press, 1995. Northwest Territories. Wildlife Service. Beverly and Kaminuriak Caribou. Monitoring and Land Use Controls. Completion Report No. 1. Yellowknife: 1978. Payne, Robert, Eyewitness: A Personal Account of a Tumultuous Decade, 1937- 1946. Garden City: Doubleday and Company, 1972. Payne, Robert, ‘Foreword’ to Tung, Rosemary Jones, A Portrait of Lost Tibet. New York: Holt, Rinehart and Winston, 1980. Pelly, David F. Thelon: A River Sanctuary Hyde Park: Canadian Recreational Canoeing Association. 1996. Porsild, A. E. Reindeer Grazing in Northwest Canada. Ottawa: Department of the Interior, 1929. Ross, W. Gillies, ‘On the Barrens, 1934’ The Beaver Outfit 299 (Autumn, 1968), 48-53. Russell, H. John, The Nature of Caribou: Spirit of the North. Vancouver: Douglas and McIntyre, 1998. Schemnitz, Sandford D., ed. Wildlife Management Techniques Manual. 4th ed. Rev. Washington, D.C. The Wildlife Society, 1980. Smith, Donald B. Long Lance: The True Story of an Imposter. Lincoln and London: University of Nebraska Press, 1982. Tung, Rosemary Jones, A Portrait of Lost Tibet. New York: Holt, Rinehart and Winston, 1980. Tyrrell, Joseph B., Report on the Doobant, Kazan and Ferguson Rivers and the Northwest Coast of Hudson Bay. Ottawa: Geological Survey of Canada, 1897. 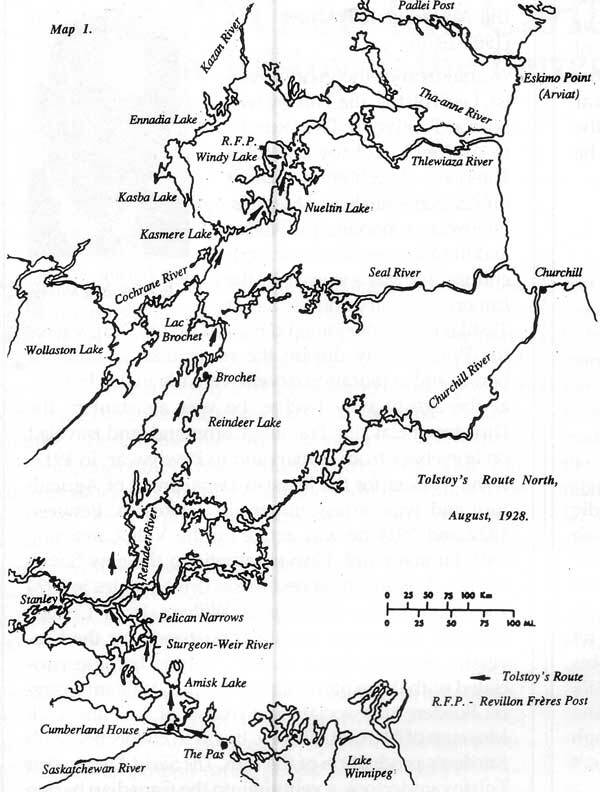 Tyrrell, Joseph B., Report on the country between Athabasca Lake and Churchill River. Part D. Annual Report. Vol. 8. Ottawa: Geological Survey of Canada, 1896. Tyrrell, J. W. Across the Sub-Arctics of Canada. Toronto: William Briggs, 1897. Usher, Peter, J. Fur Trade Posts of the Northwest Territories, 1870-1970. Otttawa: Department of Northern Affairs and Northern Development, 1970.